The idea is incredible! Children of all ages can easily draw leaves! Fall crafts are so nice to do because of their beautiful warm colors. But we always do the same things. We rarely find new ideas to entertain children. That's why we find this idea absolutely great! It's almost like magic! The candle wax divides the beautiful colors you will add to the paper. It will form 3D leaf veins on the painted autumn leaves. A simple technique to achieve, but with very impressive results. The kids will love this! 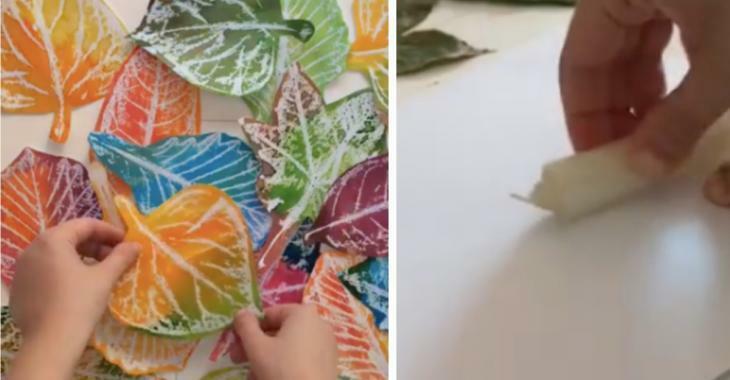 Teach children how to rub the wax of a candle on a white sheet of paper placed on a leaf of a tree, but still well hydrated, and then paint it with beautiful autumn colors. An idea so well thought, which will then allow you to make beautiful banners to decorate the classroom, the daycare, or child care facility. 1) Place a tree leaf of your choice, still well hydrated, under a standard white printer sheet of paper. 2) Then rub the wax of a candle on the white paper. 3) Then, with an artist's brush, apply the watercolors of your choice on white paper to bring out the white wax strokes you made earlier. Orange, red, maroon (brown) yellow, a little green, mauve, purple, turquoise. 4) Let dry completely before handling. 5) Once the paint is completely dry, cut the outline of the leaves with the scissors. 6) Drill two holes in each leaf stem. Or, on the tip of some leaves to add a little fancy to the streamer. 7) And put string in the holes of the leaves to make a pretty autumn banner. See all the creation details in the following video. It's like magic! The veins of the leaves will look 3D. Because the candle wax will divide the colors of the painting and the white lines in three dimensions, this will also bring out the beautiful colors of autumn. Really, this idea, it's downright awesome! Do you like this autumn DIY project? Share it!